Laura Renwick needs no introduction; she is the highest ranked GBR lady rider in the World FEI show jumping rankings and has amassed a number of championship wins. If you hadn't got into horse riding, what job would you have done? I actually tried quite a few careers before I finally got serious about show jumping, including being an air hostess! My other dream job was to be a professional tennis player, although I don’t really get to play it very often. Have you ever tried any other equine sports? I did when I was younger but not since being an adult. I wouldn’t dream of jumping the cross country fences the event riders jump – they are huge and uncompromising! At least show jumps fall down! Which horse, past or present, would you have most liked to ride on? Based upon the horses I think would suit me and that I’d most enjoy riding, I’d have to say ‘Fit for Fun’ ridden by Luciana Deniz, or ‘Hickstead’ ridden by Eric Lamaze. Which is your favourite show? I love Madrid as it is very traditional and the atmosphere there is incredible. It’s a very special occasion because of the huge public support and the footing is always excellent. ‘Never give up’ or to put it another way ‘if at first you don’t succeed, try and try again’. My Nan always told me that and it has stuck; I think it is so useful in all areas of your life, not just when it comes to horses. 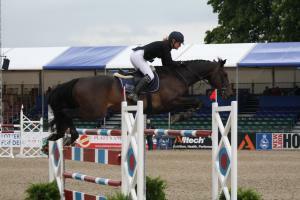 What is your top tip for jumping a clear round? If only I knew I would have clear rounds all the time! Sometimes you do everything right and you still have a fence down! Which young horse should we be keeping an eye out for? I am super excited about my own young horses which we have bred ourselves: 5-year-old Arkuga by Arko, out of my mare Beluga, 4-year-old Maverick by Diamant De Semilly, 5-year-old Burj by Billy Congo, and Shiraz by Vagabond. What are your favourite bloodlines for a showjumper? I love French horses, in particular the Selle Francais breed and of course the stallions I have used to breed my horses, Arko, Diamant De Similly, Tangelo van de Zuuthoeve (father of Bintang) and Vagabond. My husband John, as he is very supportive which makes it all so much easier – not everyone’s husband would put up with this lifestyle! He is also my trainer and trains our apprentices and grooms. At shows he is the first person I look to for help and advice. What has been your biggest win(s) to date? Winning the Queens Cup in 2009, the Foxhunter Final twice in 2010 and 2012, the Grand Prix in Madrid in 2013 and then London in 2015. Where is the most unusual place you've ever competed? Miami, where the arena was set up on the beach only metres from the Atlantic Ocean! It was amazing and quite surreal. I am currently ranked 38th in the world and I would love to get below the top 30!